these all star pickles are best w/ pulled pork, in a fried egg sandwich, atop salads or inside tacos of varying deliciousness. they are a product of the village market in the inner richmond of san francisco. kate baron, stephanie shelton & myself came up with the recipe while we were making our incredibly popular fried egg sandwich. heat up your water in a medium saucepan & dissolve the sugar in the warming water. while the sugar dissolves, thinly slice your onions. add your onions to a large big basin bowl, pour salt over onions and toss to incorporate throughly. next add in your peppercorns, vinegar, bay leaf and the optional red peppers and toss again. once the sugar is dissolved into the water, (may be done before you are finished with the above step, just turn it off and put a lid on it). pour the sugar water over the red onions. toss the onions in the warmed water/vinegar mix and let sit till room temperature. strain the onions into a quart sized mason jar and then carefully pour in pickling liquid over the top. 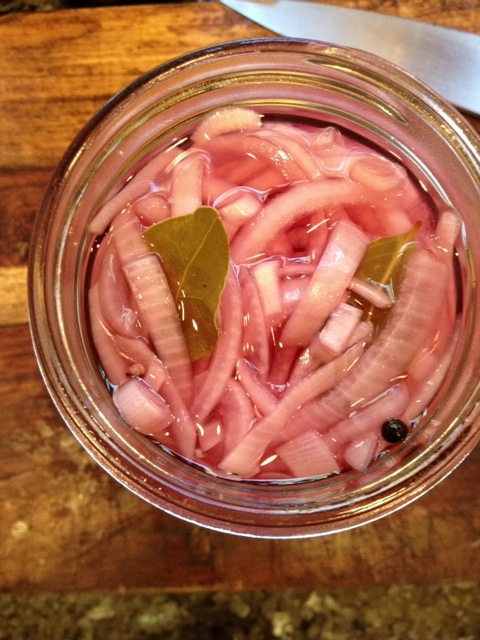 refrigerate for 12 hours, the onions will lighten in color and the pickling liquid will turn a lovely soft pink.